The Fiasco! iPhone app is a cool blend of Words with Friends and Tetris. This social game requires you to create words from random letters that fall from the top of the game board. Fun power-ups and simple interface make this free download from the iTunes App Store engaging. The game board is a grid against a light blue background. When you start, squares marked with letters drop from the top of the screen. One or more squares may be available. Multiple squares may be arranged in an “L” shape or “T” shape. Like Tetris, you want to connect squares. However, with Fiasco!, you want the connected squares’ letters to spell words. You use gesture controls to plug the letters into the best slot on the screen. You tap the screen to rotate the letters falling from the top of the screen. You swipe horizontally to move them to the preferred location. You swipe down to make the letter fall faster. As words form, you tap them to remove them from the screen and redeem your points. The tips and tricks section of the Fiasco! iPhone app tutorial is filled with tons of cool ideas, but you can pick up on strategy without reading them. 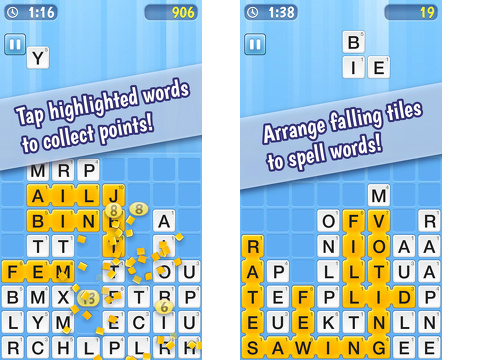 Crossword puzzlers who have a vast knowledge of short, obscure words dominate this game. 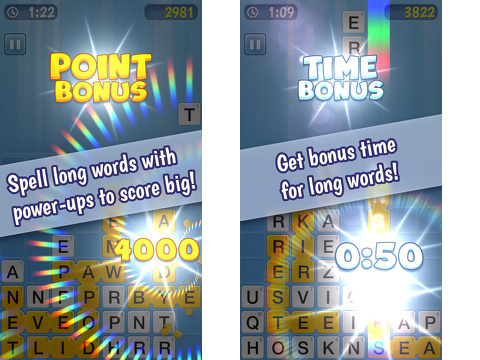 You can earn more points with longer words, but that requires a crazy blend of patience and speed. If you perfect both strategies, you can use them effectively against opponents. The Fiasco! iPhone app only works in social mode. You sign-in through your Game Center account. You can invite your existing Game Center friends, or you can play against a random user. The cool part of social gaming is playing against friends, but the un-cool part is waiting for people to take their turn. It would be nice to have a single player mode. I believe that could be another opportunity to monetize with in-app purchases. Fiasco! is a free download with a specified number of coins. You earn coins with each word, but you must redeem them to play a game. For power-ups, you must also use your coins. You can purchase packages of coins ranging from $.99 – $24.99. You can also earn coins by connecting with Facebook and Twitter. The Fiasco! iPhone and iPod Touch app is a fun, fresh perspective on social gaming. AppSafari review of Fiasco! Free was written by Jenni Ward on May 9th, 2014 and categorized under App Store, Free, Fun, Games, Kids, Puzzler, Social, Strategy, Word Games. Page viewed 14383 times, 2 so far today. Need help on using these apps? Please read the Help Page. Seems like a funny game! I think it’s a great game! I liked this game, too good to pass the time. Another extremely addictive game to pass the time! I postponed a meeting to finish reading this article. That’s how valuable it is! Glad I found your site this morning. Excelente! I’ll download now. One more game in my iphone to spend my free time. Thanks for reviewing it. I’ve never seen a quality content so good. Very cool! Congratulations, Its very nice post. Thanks for sharing with us. The friends who installed it are loving the app. Very cool this article. Thanks for sharing. Safari is great! I share this! I loved this article. Thank you very much for sharing with us. The app is good, but I’ve found other better ones here! I like a lot this site. congratulation for this informations. Great this site. i hope to read more things here. Esse aplicativo é muito bom! Recomendo! It is a good site. Congratulation.